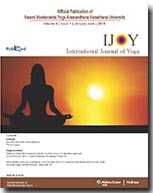 A paper concluding that a specific series of yoga poses is effective at promoting weight loss in obese women has a call for retraction in a letter to the editor of the International Journal of Yoga. All three methods were effective in weight and physical fitness management. …severe problems with the design and analysis of the study make the reported results highly questionable. Allison and his co-authors outline several concerns, including the fact that the authors did not randomize participants to different treatment groups. By violating both the principles of random allocation, the study reported cannot be properly referred to as [a randomized controlled trial]. [Table 2] of Jakhotia et al. reports baseline characteristics and tests for differences among the four groups using a repeated measures analysis of variance; this is an inappropriate test because there should only be data from one time point to consider. Furthermore, we attempted to replicate the tests using the provided summary statistics and calculated incompatible results. The objective of this study was to find differences in health-related outcomes between three exercise regimens and a control group, but the core of their conclusions focused on whether pairwise differences within the treatment groups were significantly different from baseline. This approach, where differences in nominal significance within-groups are interpreted as significant differences between the groups, is statistically invalid, producing false positives at a rate up to 87.5% for four groups. That approach should never be used; instead we suggest performing post hoc exploratory pairwise comparisons with a multiple testing correction. Considering the compromised randomization, the irreproducible baseline statistics, the use of subsequent analytical strategies that depended on the faulty baseline statistics, and the inferences inappropriately based on within-group comparisons, we believe retraction of Jakhotia et al. is consistent with the recommendation of the International Committee of Medical Journal Editors: “Errors serious enough to invalidate a paper’s results and conclusions may require retraction”. The paper has been cited once, according to Thomson Scientific’s Web of Knowledge. The formal letter to the editor was our first approach to the article in this situation. Although we encouraged the editorial staff to retract the original article in our last direct correspondence following acceptance of our letter, they have made no indication to us that it will be retracted. We’ve reached out to the first author of the paper, Komal A Jakhotia, whose LinkedIn profile says she is currently a physiotherapist in Seattle. We have also contacted corresponding author Apurv P Shimpi, who works at the Sancheti Institute College of Physiotherapy in India, and to the journal to see if it plans to retract the article. We’ll update this post with anything else we learn. I am planning to retract the paper as there are some concerns regarding methodology and statistics. The editorial team has decided not to retract the article. We’ve asked Bhat about the discrepancy.